Rod graduated from Swansea University with a degree in applied mathematics and oceanography then subsequently worked for the NERC, Proudman Oceanographic Laboratory, U.K., as a data analyst looking at coastal circulation dynamics. He arrived at BIOS in 1988 just prior to the first BATS cruise and has since predominately worked on both the BATS and Hydrostation ‘S’ time-series projects. In 2003, he received a PhD from the University of Southampton (physical oceanography) which focused on upper ocean physical and biogeochemical processes in the Sargasso Sea. In addition to the time-series work, Rod has had significant involvement with environmental impact assessments for power companies, in particular, investigating the effects of cooling water intake and discharge from large nuclear and coal fired power stations on local marine ecosystems. Presently, his focus is deep sea oceanography where he manages and serves as Co.-PI for both the BATS and Hydrostation ‘S’ programs. 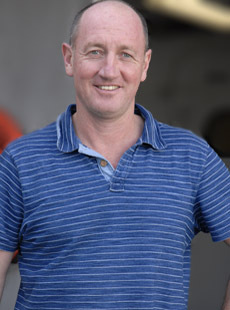 Rod has participated on more than 200 research cruises most as chief scientist and his immediate areas of interest are field oceanography & instrumentation, mesoscale eddy dynamics, biogeochemical processes and numerical modelling.